I’ve just uploaded a post about Tory minister Damian Green’s shameless lie on last night’s ‘BBC Question Time’, when he stated that unemployment had fallen for 7 months in a row. That wasn’t the only Big Lie he told on the show. Green rattled off the by-now-predictable Tory nonsense – sadly believed by too many people who don’t know better than to believe a word the Tories say on the economy (well, on just about anything, really) – about the ‘inherited mess’. But I’ve written about that before, so I won’t repeat it here. The statement ‘spent money like water’ is subjective, so while it’s patent nonsense I won’t call Green a liar for that one. However, the 2 parts I’ve highlighted in bold text are factual statements, so they’re easily checked. We’ll deal with the 2nd one first: the UK is not bankrupt and was never bankrupt under the last Labour government (nor is it even now). Not only did Britain always maintain payments on its debts under the Labour government, and has continued to do so since the last election, but the country continues to be able to borrow – at interest rates which are at a 300-year low. Usually, a bankrupt is completely unable to borrow money. If they can borrow at all, it’s at the penal rates charged by a back-street loan shark. Or Wonga. So, without question, Labour did not leave the UK bankrupt by any meaningful definition of the word. 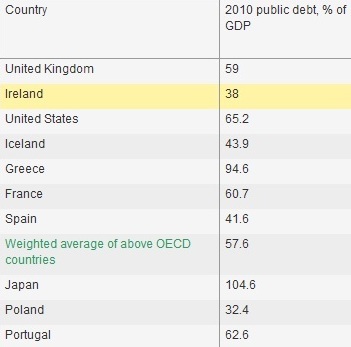 The countries I highlighted in bold text are the G20 countries in the above extract with a higher level of public debt than the UK: Japan, France, and the US – in just this very limited extract of countries. By no conceivable definition did Labour leave the worst level of debt of any G20 country. And yet, Damian Green was perfectly ready to state it as fact, on the record, in front of TV and studio audiences. 4) Have neither respect nor attention for the British people to whom it lies so freely. 5) Be utterly unworthy to run the country. ← More blatant Tory lies pt 1: unemployment fell 7 months in a row?